Car radio fascia. Item Type: Fascia. 1 Din Pocket. Size: Double Din 178 102/178 100/173 98mm. for Chevrolet. for Citroen. for Hyundai. for Land Rover. Material : High Quality ABS Plastic. Custom design allows the retention of the factory climate controls and passenger airbag light in their original location. Designed specifically for installation of double DIN radios or two single DIN radios. Recessed DIN opening. Painted silver contoured and textured to match factory dash. Comprehensive instruction manual. All necessary hardware included for easy installation. For Nissan Titan 2008-11 Harness & Antenna Connections (sold separately) 70-7550 – for Nissan Harness 95-up. .
DDIN Head Unit Provision. Painted and Textured to Match Factory Finish. Kit Features. Finished In Factory Golf Ball Style Texture. Available In Two Colors: 95-8214TB – Black 95-8214TG – GrayApplications. 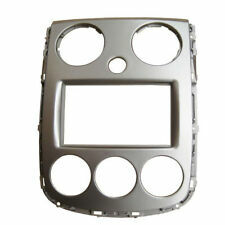 Specialized in fascia dash mount kit for years. The kit is made out of factory textured ABS plastic. It includes fully adjustable ISO mounting brackets, instructions and mounting hardware. Color finish is Black. Mazda Millenia. Mazda Protege / 5. Car stereo showed in the picture is not included, just the Stereo Panel. 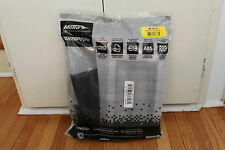 For MAZDA CX-7 2006-2012. 2: Use radio panel and secure with screws. 1: Remove the original radio. Plug and Play. 3: New Double DIN Mounting the device. Install dash kit for Single or Double DIN/ISO Radios. 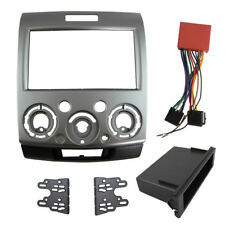 Single or Double DIN Installation Dash Kit. MAZDA 2010 CX7/CX-7. Designed and manufactured with precision tolerances, resulting in a gapless fit between the dash and the kit. This dash kit. You will need to trim the sub dash to. NOTE: Sub dash modifications are necessary to use. removed without dash panel removal. Wiring Harness: 70-1770 Ford harness 1985-2004. 70-1771 Ford harness. Kit Features. Painted matte black to match OEM color and finish. 99-8223 in Black. Painted matte black to matchOEM color and finish. • Warranty service will be refused if serial number of unit does not match that of serial number sold by us. (Ins tall a double DIN (2DIN) radio or a single DIN radio and EQ combo into. Designed specifically for the installation of double DIN radios or two singleDIN radios. Double DIN unit provision. 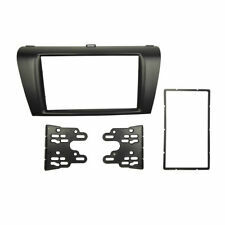 Includes: • A) Double DIN trim brackets • B) Filler bar. When the universal DVD players to be installed to most types of cars, have to take out. Color: Glossy Black. 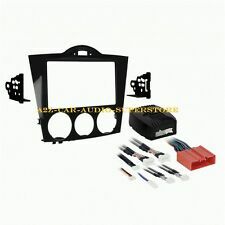 CARAV 11-106 Car Radio Install Dash Kit. Inner size : (CARAV 11-106). CARAV 11-106 Car Radio Installation Trim Fascia Panel. Special For:MAZDA. MAZDA (6), Atenza 2002,2003,2004,2005,2006,2007 w/pocket (PCB for Manual Air-Conditioning). This kit is made of factory textured ABS plastic. It fits 2-DIN, Shaft & ISO mount radios. There is no cutting required for DIN applications and it has a recessed DIN opening. Features custom designed mounting brackets, DIN sleeve support rails and ISO mount capability. • Designed specifically to accommodate double DIN units. MAZDA 3 2004-2009. • Provides custom radio install appearance. • All Necessary hardware included. This mounting kit is made out of factory textured ABS plastic. It includes fully adjustable ISO mounting brackets, instructions and mounting hardware. This is what most consider is the hardest part of the installation. Fuse Holders. DIN Head Unit Provisions With Pocket. ISO DIN Head Unit Provision With Pocket. - Dash Kits. - Sound Damping. - MP3 Player Accessories. - 12 Volt Power Supplies. Empty Sub Boxes - Ford. We design,test and produce under high standard of Taiwan quality. Recessed DIN opening Double DIN and or two ISO mount radio trim included Contoured to match factory dash Comes with oversized under-radio storage pocket High grade ABS plastic All necessary hardware for easy installation Comprehensive instruction manual Applications 2001-2002 626 1998-2005 Miata 1995-2002 Millennia 2001-2004 Protege 2001-2004 Protege 5 2001-2006 Tribute 1996-1999 MPV . 70-7901 – Mazda Harness. 70-7903 – Mazda Amplifier Interface Harness. Kit Features. • We strongly encourage professional installation of any electronic devices. • Warranty service will be refused if serial number of unit does not match that of serial number sold by us. (Econoline Full Size Van 1997-08. six disc in dash) 2001-02. Town Car 1995-02. • We strongly encourage professional installation of any electronic devices. Grand Marquis 1995-08. Mountaineer 1997-01. Escape 2001-07. (Econoline Full Size Van 1997-08. six disc in dash) 2001-02. Town Car 1995-02. Marauder 2003-04. Grand Marquis 1995-08. Explorer Sport Trac 2001-05. B-series Pickup 1995-08. Expedition 1997-98. Car stereo showed in the picture is not included, just the Stereo Panel. 2: Use radio panel and secure with screws. 1: Remove the original radio. 3: New DOUBLE DIN Mounting the device. About the window size of your car headunit. Product Features Install Dash Kit for Single or Double DIN Includes pocket below radio for Single DIN Mounts Painted Matte Black to Match Factory Finish Precision Fit and Made From High Grade ABS Plastic Dash Kit Includes Radio Housing Climate Control Housing Radio Brackets Pocket for Single DIN Install (2) #8 x 1" Phillips screws (4) #8 x 3/8" Phillips Screws (6) Plastic Panel Clips Harness Vehicle Compatiability List 2006-2008 Mazda 6 (North American) .